Past the border, we drove through mountains down to the sea. Ian and Kate welcomed us with open arms. We all felt that we already knew each other from our SMS's and the comments of Doreen and Alec. They have a cute little cottage which they purchased 2 years ago and have 'done up'. This included adding a bathroom, covering the dirt floor in the bedroom with a wooden floor and putting in water and electricity. The effort has been worthwhile. The next big task is changing the barn into a visitors cottage with its own bathroom and kitchen. As accomplished learner builders they are assisting other British people fix their houses. Besides the building skills they now have, they also speak a reasonable amount of Bulgarian and can read Cyrillic script. A definite advantage and much appreciated by the British who are settling in the area. Our efforts to have mail from SA at their house before our arrival failed and we must now wait on South African Banks and the postal services. Dimchevo is a hamlet with houses, a shop and a pub. The villagers grow their own vegetables and keep sheep and goats. The sounds we hear at night are of owls, dogs and birds. Wonderful and relaxing. Besides doing the normal chores and watching television to catch up on the news we all went on a picnic down by the reservoir. We, meaning the British residents in the area. It was a lovely day playing Boulle, shooting at a target with rifles and just sitting around chatting. No doubt in the future the number of British and other Europeans in the area will increase now that Bulgaria is part of the EU. Apparently most of Bulgaria is for sale and some street signs have Roman as well as Cyrillic script. There are also a number of Bulgarians who speak English. Burgas is the nearby main town and has a lovely boulevard on the Black Sea. Still waiting for mail, we decided to take a meander through the Bulgarian countryside. 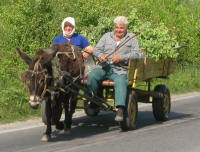 The river plain inland from Burgas consists of green, soft, rolling hills fertile and cultivated. These gradually became larger hills then mountains the further south and west we traveled. We tried to keep as far south as possible and ended up taking quite a few roads which ended at towns in the border area. Most of these roads followed rivers or streams which we parked beside during the nights. Some views are like Switzerland in summer without the snow capped mountains. The rivers do not just provide water, they also provide sand and stone for building. We watched fascinated at the night camp near Smiljan as a truck came down to take a load of sand and stone. It managed to become stuck in the sand so the men in the truck threw the sand that they had to remove to dig the truck out into the truck. That's what I call killing two birds with one stone. New houses are built of bricks so I assume they were building a fence or a barn. Our camp sites were generally beside a river where we could listen to the rushing water, the frogs and the birds. Sometimes cows or sheep passed by on their way home. There are water points everywhere - cold fresh mountain water. We had lots of laughs when asking directions. "Is this the direction to Pesteria?" we would ask. There would be vigorous shaking of the heads. "Well is it that way then?" Vigorous nodding of the heads. But HANG ON this is Bulgaria. Shaking the head means YES, nodding the head means NO. The police are magnificent when it comes to directions, they are very careful to keep their head still and say yes or no. Of course sometimes they do shake their head and mean no. It can be very confusing. Our biggest problem with directions was getting out of Smolyan. We had met some British residents who said there were 3 lakes at Pomponovo where they lived. It sounded a good place to stop for the night and so we tried to head there. We went round and round in circles, even asked a policeman and eventually went up another dead end road. We did find a lovely place for the night right by the river in the Border Area. The next morning we were woken by the police checking up on us. They were very friendly. We headed back to Smolyan and eventually found where we had gone wrong and managed to leave the town behind. A little further on at Devin we lost the road west and ended up following a river north past two very deep dams. Some of the houses flooded by the dam survived and are now being used as boat hoses. The water here has yet to be exploited properly but it is a magnificent setting for water sports with hiking as a bonus. There are many abandoned buildings and businesses away from the main roads. In contrast there is a lot of building development in the towns. There also seems to be a lot of new and developing business activity. It may take a while but Bulgaria definitely seems to be improving economically. Agriculture has not changed much in the mountain areas. The soil is tilled by hand or ploughed using horses. Planting, weeding and picking of the crop is manual. During planting the seedlings are watered using a watering can. Seedlings are grown by the farmer in knee high tunnels, usually in the front garden. Small horses with small carts vie with cars and trucks for the use of the roads. When a person only owns one cow it is taken for a walk on a lead, just like a dog. Wood is stripped by hand. The mountains come to an end in the west and we decided to go to Sofia. We saw evidence of Bulgaria being for sale south of Razlog. This is a winter sports area although I could only see 3 ski runs from the road. There are new apartment blocks, golf estates and other housing developments everywhere. Advertising is all in English. After reading up on Sofia in Let's Go we wanted to see the Khali market and the cathedral. It sounded like a great idea to treat ourselves to dinner in the market. Eventually we found the centre of Sofia. The sign posts to the centre run out long before you get there and there are no street names in Roman script. The next step was to find a parking spot. Eventually we found one right near the market and ended up staying there for the night. The market was a disappointment. It is 3 stories, very clean (except for the toilets) and well organized but quite small. There is only 1 restaurant, the rest being fast food places. There was however a McDonalds nearby and we used their hotspot to catch up on e-mail. By the time they closed it was after 11pm and definitely past our bedtime. The noise did not stop all night. We expected quite a lot of traffic noise which happened. But it sounded as if a large metal structure was being dismantled during the night - all night. The din was increased with the sound of trams running over bouncing tracks and loud people shouting at each other. Thoroughly unrefreshed we headed for Serbia and Montenegro and the Adriatic. The Bulgarian border was a breeze as was the Serbian border until they asked for the Green Card. This is 3rd party insurance for the vehicle. We had purchased a 3 month card in Turkey and been assured it was valid for Eastern Europe. Bulgaria accepted it after some arguments but Serbia was having none of it. One month Serbian insurance would cost 126 euro! This is exorbitant as far as we are concerned. Especially as we only planned on being in the country for a week before returning to Dimchevo. We turned around and went back to Bulgaria. Again this was very easy to do. Pity. Montenegro advertises on CNN. Perhaps they only want the rich tourists. 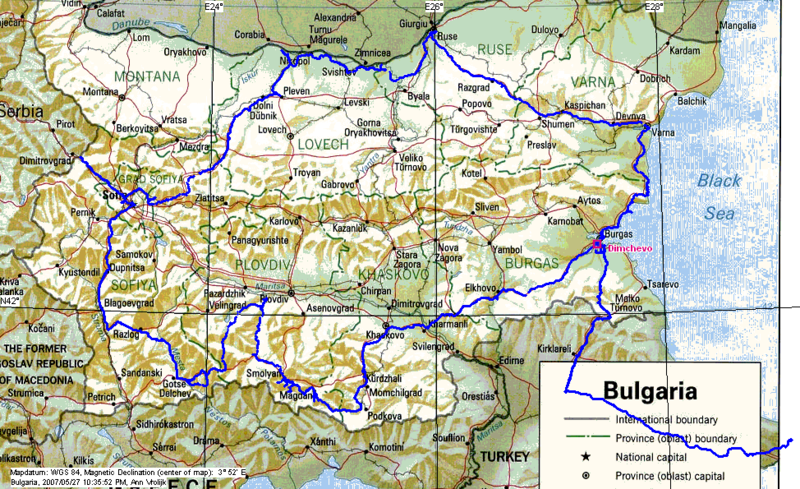 There are other routes to follow and no-one need go through the country to travel through Eastern Europe. We would certainly recommend giving it a miss. We will not have time to go to the Adriatic via another route though. We have also discussed going into Romania for a short visit. I have been to Bucharest and remember a lovely city. Since then Nicolae Ceausescu has been and gone. Apparently he razed 5 square kilometers of the city to put up a huge Civic building using typical communist architecture - massive, drab and intimidating. Only the Pentagon is larger. I would not like to have my memories marred by this so we will stay in Bulgaria. Much refreshed after a good nights sleep we headed for the Danube. 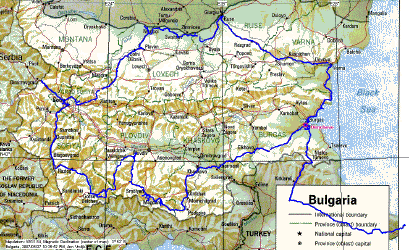 This is most of the northern border of Bulgaria and we managed to get quite close at times. The river is broad and the banks are littered with abandoned buildings. There is a dike and beyond this on the river side there are many birch tree plantations. Cultivated fields only start on the side away from the river. There are very few fences and no-one minds if you travel on the dirt tracks between the fields. The first night we stopped near an abandoned pump station and watched amazed at the amount of traffic. First there were the tractors taking wood from the birch plantation. Then there were several different cars parking at the pump station while the men went walking off towards the river. The tracks here follow the river for some time without any evidence of houses or people living there. We do not know what the men found down there but they were obviously pleased with it! The second night we camped on the river's edge. We found this glorious spot by following the tracks between the cultivated fields and over the dike. This time we were totally alone. We could sit and watch the barges being pushed up and down the river, watch the cormorants and herons, listen to the frogs and enjoy the solitude. A group of forestry workers came to say hello in the morning. They were enthusiastic about our trip and asked us to lunch or so we thought. Lack of a common language made explicit communication difficult. They obviously wanted us to stay around for a while. 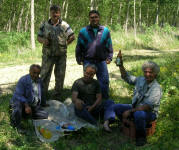 Eventually a horse and cart drew up with beers for the men and some ice cream for us. We thanked them, ate it and then moved on. All a bit weird. On Wednesday we followed the Black Sea Coast back to Dimchevo. The countryside continued to be an undulating plain. There is quite a lot of tourist development in the areas with beaches. We stopped for a visit to Nesebur. This is an old town with building from the 14th century. The old buildings were decorated with different coloured bricks and courses of pottery, very interesting. It has a lovely 'olde worlde' charm probably enhanced by the tourists. Back in Dimchevo the wait for mail continues. We will give it another week before we give up and move on. We camped out by the Lake enjoying the scenery and attending to odd jobs. This included replacing our large water tank which was lost somewhere in the Rodolpho Mountains. The mail did not arrive. Letters from England arrive but not from SA. 3 out of 7 is an extremely poor showing of the efficiency of the postal service. Now we are in Turkey, camping on a spot along the Bosporus where normally no car is allowed to park, it’s difficult to write about another country, Bulgaria in this case. Not that there is anything wrong with that previously communist country, on the contrary. It’s obvious Bulgaria, already a member of the European Union, is extremely busy puling itself away from the grey, socialist state the communists called Utopia. But it has a long way to go. We toured the country for two weeks and were struck by the sight of numerous buildings, factories, installations and machinery that was abandoned and left where it was as if touched by a powerful wand that struck collectively. Now it is over 10 years since the end of communism and yet, the country seems to be strewn with the litter it left behind. But there are many more positive things to tell about the country: it’s beautiful. Its green, hilly and mountainous in places, with numerous lakes, rivers and plains, all intersected with side roads and farm tracks, no-where closed off with gates or fences. Cattle and other farm animals are herded or shepherded, single animals tethered. The country is one gigantic, glorious camping place where every little path leads to a brilliant camping spot with shade, privacy and level ground, never far away from a cuckoo. An added bonus, from our point of view, was the real melodious bells of cows, goats or sheep herded past our camper in the morning as a delightful way to be told it was time to face a new day. OK, the roads are not so good, the sun doesn’t shine every day either, but there is pork as in contrast with Islamic states where the short-ribs are no-where to be found for a good braai (BBQ). We loved Bulgaria and can’t escape the thought that so many adventurous campers, especially those with a camper or car-and-tent combination instead of caravan, would be much happier in Bulgaria than in Spain, for instance. Bulgaria is the place to go and will gain popularity over time when shopping malls and good roads have become the norm also here, rather than the exception.